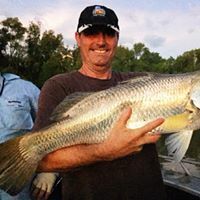 Beautiful big barra’s being caught in Daly River Mouth this month. Bruce and the boys enjoyed a great week away in April, fishing for all species but landing some awesome size barra. They spent 7 days on the water, living aboard our 65foot Mothership Brute Force, fishing the Daly River Mouth, Peron Island, Cape Ford, Cape Scott and across the coast to the Moyle Region.